Jiggs Jaeger was undoubtedly one of the most charismatic, talented and popular characters ever to serve in Army music and he is still very fondly remembered by so many who served under him and enjoyed his music. He was responsible for the music at great ceremonial events such as the Investiture of The Prince of Wales and the State Funeral of Sir Winston Churchill, as well as annually at the Trooping the Colour and at the Cenotaph. He also directed the iconic Marching with the Beatles recording which found a place in the charts and was heard regularly on the radio. Jiggs was brought up more or less as an orphan and joined The Kings Own Yorkshire Light Infantry as a 14 year old band boy in 1927. While studying to become a bandmaster he was a founder member of the Kneller Hall Trumpeters, playing in Westminster Abbey at the Coronation of George VI in 1937. He was appointed Bandmaster of the 4th Hussars in 1942, serving with them for the remainder of the war years in Italy, Greece and Austria. In 1945, as a still very inexperienced bandmaster, he was given the honour of conducting the Vienna Symphony Orchestra in a series of five concerts. He served for a year as Director of Music at the Royal Military Academy, Sandhurst, where he directed the band at the first Sovereigns Parade. 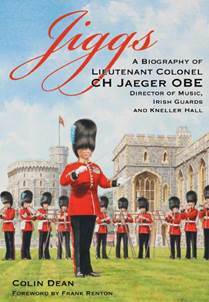 In 1949 Jiggs was appointed Director of Music of the Irish Guards and served in this post for 19 years, becoming a hugely popular figure at bandstands and concert halls throughout the country. He appeared with the band regularly on BBC Radio and was once the Castaway on Desert Island Discs; he is still seen regularly on television introducing a concert in the film The Ipcress File. He also conducted the Black Dyke Mills Band, twice coming within a whisker of winning first prize in the National Championships. The last two years of his all too short life were spent at the pinnacle of Army music as Director of Music of The Royal Military School of Music, Kneller Hall. He died on 27th September 1970, aged just 57. Available from: Ron Shooter, 21 The Uplands, Bricket Wood, St. Albans, Herts, AL2 3UW. £20.00 including UK postage  cheques payable to IMMS UK Branch.